City Folk performs a benefit concert on March 28. SANTA CRUZ, CA--The popular trio City Folk is coming together Wednesday, March 28, for a reunion concert at The Attic with special guest Alisa Fineman. The concert, a fundraiser for the Friends of the UCSC Farm & Garden, will begin at 8 p.m. Tickets are available at The Attic for $15 in advance or $18 on the day of the show. The Attic is located at 931 Pacific Avenue in Santa Cruz. 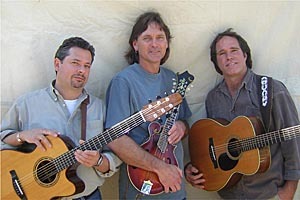 City Folk, a "mostly acoustic" trio with Keith Greeninger, Kimball Hurd, and Roger Feuer, came together in the late 1980s and quickly became known for their song writing, seamless three-part vocal harmonies, and musical arrangements. The group, which released three albums, performs rarely since their final national tour in 1995. Feuer plays lead guitar, while Greeninger sings lead vocal and plays rhythm guitar. Hurd also sings lead vocal and plays a variety of instruments, including guitar, mandolin, mandola, banjo, and dobro. A popular singer/songwriter, Fineman has recorded three CDs, Cup of Kindness, Better With Time, and Closing the Distance: Poems, Prayers and Love Songs. Fineman was voted "Best Folk Musician" four years running by the Monterey Bay's Coast Weekly newspaper. Her new CD, Closing the Distance, features contemporary arrangements of traditional and original songs from the Jewish diaspora. On Closing the Distance, produced and co-arranged by Alex de Grassi, Fineman sings in Hebrew, Ladino, and English. The benefit concert is part of a yearlong celebration of UCSC's leadership in sustainable agriculture, which began with the founding 40 years ago of the Apprenticeship in Ecological Horticulture. The nation's leading hands-on training program in organic farming and gardening, the apprenticeship is the oldest of the programs offered by the Center for Agroecology & Sustainable Food Systems at UCSC. Widely regarded as one of the most significant influences in the growth of sustainable agriculture--some call it the birthplace of organic farming--the apprenticeship has prepared more than 1,200 graduates who have spread their expertise throughout the world. High-resolution photos are available for download: City Folk; Alisa Fineman.